Colombia is a land of contrasts. It has been marked by a history of violence since the early days of the colony. Social and cultural hierarchies led to a very unequal distribution of wealth, mainly of wealth in the form of land. The concentration of vast extensions of the territory in a few hands meant the large majority of local communities lived in poverty, conditions that have become extreme over time. Civil unrest did not take long to appear and a bitter armed conflict began to shape the current history of the country with blood. The forced displacement as a result of land grabbing for economic reasons, to control territory or build up private wealth has turned Colombia into one of the most unequal countries in the world and the one with the second highest number of internally displaced people. With 7.4 million victims (UNHCR 2016), the phenomenon of internal displacement over the last few decades has had a huge impact, one which the state has tried to address with different political and legal instruments and frameworks. It has, however, made very slow progress because of the complex nature of the conflict and its accompanying social interactions. The problem of land ownership and distribution has historically been elated to the armed conflict in different ways. The current cycle of conflict that began in the 60s had its origin in agrarian disputes. In that sense, the topic has always been at the heart of the programs and discussions of the guerrilla groups. History suggests that the new cycle of conflict was sparked by the state’s inability to adequately face the overlap of diverse social and institutional exclusions and the weighty heritage of political violence (Álvarez and Gutiérrez 2015). Agrarian inequality provided the basis for the rebel uprising and for a weak system in which institutional regulation capacity over the land was very limited. Vast expanses of land became important military resources that allowed powerful and radical landowners to organize armed paramilitary bands that shot peasants who claimed land redistribution. 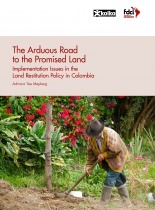 Finally yet importantly, the expansion of the armed conflict is related to multiple forms of territorial occupation: land grabbing, cheap acquisition, and forced land abandonment became routine in rural Colombia. Für den Inhalt dieser Publikation ist allein das FDCL e. V. verantwortlich; die hier dargestellten Positionen geben nicht den Standpunkt der Europäischen Union wieder. gleichen Bedingungen 4.0 International Lizenz (CC BY-NC-SA 4.0).